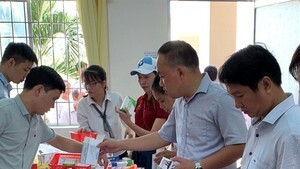 Upon tainted several dozen bottles of Tan Hiep Phat company’s Dr Thanh herbal tea, reportedly containing dregs, the company’s distributor Viet Loan Co., based in the Mekong delta province of Ca Mau, was fined VND12.5 million (US$564.3) for not having a food safety certificate, said Tran Be Ngoan, head of the province’s Food Administration on December 29. Additionally, the distributor was fined VND4 million (US$180.5) for preserving its products in an unhygienic place. Before inter-department inspection team paid a visit to Viet Loan company where inspectors uncovered 64 Dr Thanh beverage bottles having dredges inside. Inspectors seized the products and asked the company not to sell to the market. The man is not the only consumer to have found Tan Hiep Phat products containing strange objects. Many consumers are mocking that whenever the quality of a Tan Hiep Phat product is questioned, those who buy or sell it will be punished, instead of the company that made it.